This blog explores why so many projects fail to meet expectations and how you can shift your focus to what the ~30% are doing to achieve tangible success. Why Do So Many Healthcare IT Projects Fail? It is important to consider the uniqueness and critical impact that healthcare has on every aspect of people’s lives. To support and protect patient lives and conduct 24/ 7/ 365 business operations, the investment in strong industry-supporting project management is critical to drive your projects to success. The shift to value-based care requires healthcare leaders to be intentional about their commitment to quality improvement, to sustain real change in healthcare’s complex environment. Technology is a core aspect of how we do business and how we care for patients. Common examples include such initiatives as: implementing a new Electronic Health Record (EHR), updating imaging software, constructing a state-of-the-art facility with the latest Internet of Things (IoT) or smart technology, upgrading clinical applications to incorporate analytics, purchasing new robotics equipment for the operating room, or adopting new Enterprise Resource Planning (ERP) systems to facilitate core business functions. For each of these initiatives, organizations must define success in tangible terms. The definition of success is evolving. In the past, measures of scope, time, and cost defined project success. Expected benefits are also vital and contribute to transformation and alignment with the vision, and values, of every IDS (Pulse of the Profession, 2017). So... What Drives Success at Champion Organizations? Industry advocate organizations, like HIMSS, KLAS Research, and Modern Healthcare, are continuously exploring how transformation at the micro department level can impact the entire organization, setting the tone for growth, innovation, and value. Require Executive Sponsors Who are Committed to the Initiative. Enthusiasm, direction, financial investment, and goals are set by the project sponsors, with collaborative input of impacted departmental stakeholders. Effective project sponsors are available, actively engaged, influential in removing roadblocks and setting the tone for the project. They also work with those who will achieve key goals and ultimately assume the accountability role to board members or other executive players (Pulse of the Profession, 2018). For example: A Computerized Physician Order Entry (CPOE) implementation project was sponsored by a Chief of Surgery, who had the internal influence, knowledge of the physician and surgery areas, and overall alignment with the strategic organizational vision to improve patient care and physician satisfaction. This does not mean that other key stakeholders are not involved regularly. This does mean that the ultimate resource accountable for the program/ project was a single person with a clear vision of the goals to be attained. Maintain Control of Scope & Define an Acceptable Change Control Process. According to PMI’s Pulse of the Profession, 2018 survey- “52% of projects completed in the last 12 months experienced scope creep or uncontrolled changes to the project’s scope—up from 43 percent five years ago”. Represent the full spectrum of healthcare operations by forming cross-functional and multidisciplinary teams. This includes executive leadership, IT, clinical and ancillary departments, providers, and product vendors. Project leaders must focus on team cohesiveness, collaboration, and genuinely understand end user frustrations and how technology can support workflow to drive the most successful outcomes. Make the investment in healthcare project and program management talent who use standardized processes to navigate the healthcare landscape, streamline digitization, manage constraints, lead change, and sustained organizational transformation. 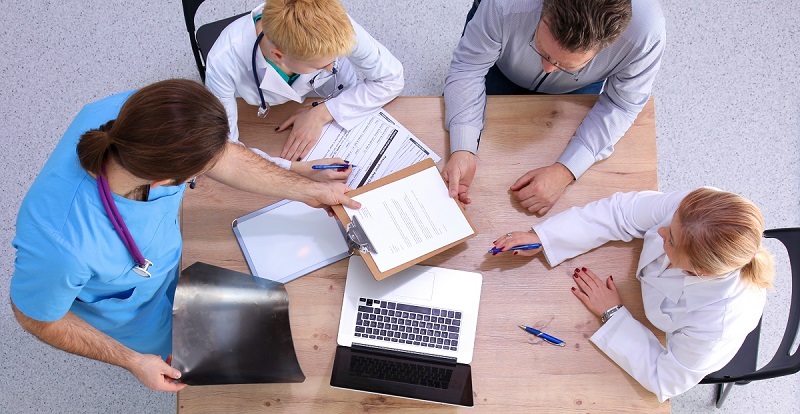 Build synergies across the team and understand that healthcare IT initiatives support ongoing industry shifts and require strong project, process, and change management. Leverage the centralized function of a project management office (PMO), as "41% of organizations with an enterprise- wide project management office (EPMO) report it is highly aligned with business strategy.” Executives must use their PMO's for project governance and to drive value delivery (Pulse of the Profession, 2018). In Part 2, I’ll explain the Project Management Technology Quotient (PMTQ), share risk mitigation strategies, and provide recommendations for choosing the “Right Healthcare IT PM”. ROI’s team members average 10+ years of experience in healthcare within their respective technology and departmental specialties. Each has a commitment to our core values and culture of passion, partnership, collaboration, value, knowledge, and quality. Contact us today!